Michael Lillas has been digesting and summarising cases of the Supreme Court of Tasmania since 1972 and during that time he has indexed and digested cases from as early as 1898 through to 2011. The treatment of the subject matter in the judgments in this resource book is very reminiscent of the Indices of the All England Law Reports and the Author hopes that this will aid the reader. Tasmania as the smallest of the State jurisdictions in Australia and has the smallest set of State precedents for the Justices to draw on. 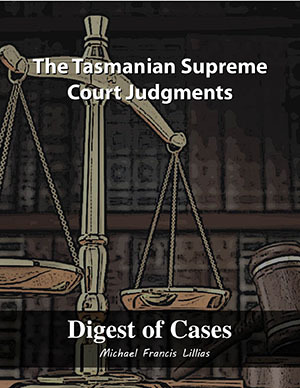 Consequently, the Supreme Court of Tasmania, which is regarded as a very strong Supreme Court, has often been required to consider judgments outside the Tasmanian Jurisdiction. It is this Judicial process that makes the resource Tasmanian Supreme Court Judgments particularly valuable as its scope is not limited to a single State Jurisdiction. Description:1 v. (various pagings) ; 21 cm. Subject:Tasmania. Supreme Court -- Digests. Copyrights © 2015 lillas. All Rights reserved.